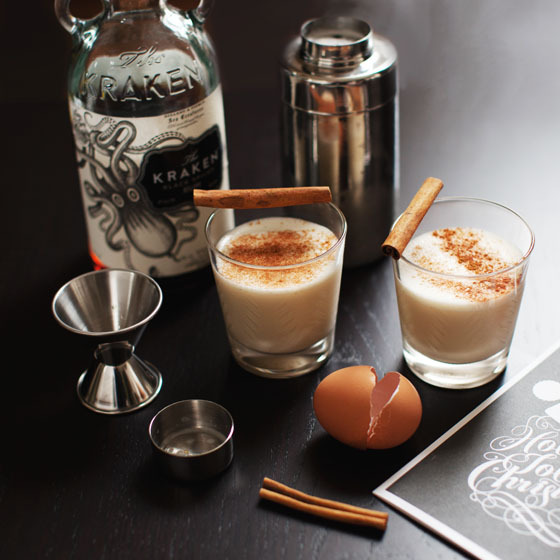 Here’s a classic style nog cocktail that you can quickly mix up for yourself or guests. This recipe typically makes one tall drink, which is perfect for me since I often drink alone during the holidays, but I digress! If you want to make more, just double or triple the recipe. Shake VERY WELL. Then add ice and shake vigorously again and strain into a glass. Dust with cinnamon and serve with a cinnamon stick stir. I know some of you may be sketched out by using raw eggs in drinks, but it’s fiiiine. Some things you can do to avoid any kind of risk is to make sure you buy the fresh eggs, store them in the refrigerator, and wash them before use, and if you’re super sketched out you can buy pasteurized eggs.